White sand. Clear water. Exotic rocks. Beautiful lagoon. This is the most gorgeous beach I have visited so far. Klayar Beach! 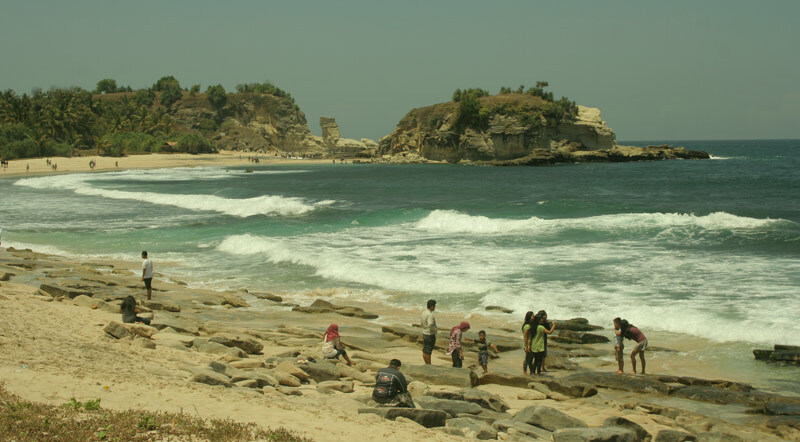 It is located at Donorojo District, East Java Province, about 60 minutes or 35 km west toward Pacitan City. Since it is quite secluded and not familiar to many people, you can find a peace of mind while enjoying the beach. The trip to Klayar Beach pumped my adrenaline due to the narrow, winding and even extreme up and down road. Yet the beautiful scenery of green hills and valleys along the way made the trip worth it. What is so special on Klayar Beach? When I first arrived, I was amazed by the lovely view around. Coconut trees are along the beach side and your eyes will easily catch some big beige rocks. One of them looks like the Sphinx in Egypt: the body of a lion and a human head. But of course, it’s not. The rocks and the Sphinx-like have been shaped for thousands of years by nature, not by human hand. You can take a walk on the soft, white sand with bare feet and go up the high rocks to enjoy the landscape. Just be careful not to slip. There, you can see the waves hitting the rocks, making seven meters high of spurt, and feel the refreshing wind. In the east side, you can climb a hill and find a small lagoon behind. But again, be very careful since you can slip anytime. The lagoon is composed by wonderful black sand. You can dip your feet in the shallow water and find some small fish and other tiny ocean creatures. The rock and sphinx in picture above! I wanna take some pictures there.. Must be awesome!